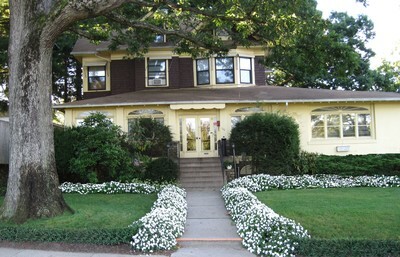 Our home was built in the 1900's as a private residence. Though it has been expanded throughout the years to better serve our families, it still retains its homelike atmosphere. The building is handicapped-accessible and has parking available. Take George Washington Bridge to Palisades Interstate Parkway North. Take Exit 6W-Pearl River, Orangeburg Road West. Go to 9th light and make a right onto South Middletown Road. Go ½ mile and make a left onto Franklin Avenue. Wyman-Fisher Funeral Home is two blocks down on the left. Take New York State Thruway North over Tappan Zee Bridge to Exit 13S-Palisades Interstate Parkway South to exit 6W-Orangeburg Road West. Go 9 traffic lights and at the 9th light, make a right onto South Middletown Road. Go approximately 1/2 mile and make a left onto Franklin Avenue. Wyman-Fisher Funeral Home is two blocks down on the left. From From New Jersey/ Kinderkamack Rd. Kinderkamack Road becomes Route 304 when you enter New York State. Make right onto Central Avenue in Pearl River. Go to 2nd traffic light and make a right onto William Street. Go to stop sign and make a left onto Franklin Avenue. 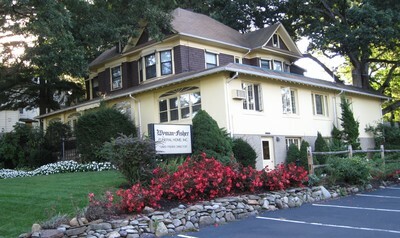 Wyman-Fisher Funeral Home is on the right, just past the library. Make a left onto Central Avenue in Pearl River. Go to 2nd traffic light and make a right onto William Street. Go to stop sign and make a left onto Franklin Avenue. Wyman-Fisher Funeral Home is on the right, just past the library. Make right onto Central Avenue in Pearl River. Make 2nd left onto John Street. Go to stop sign and make a right onto Franklin Avenue. Wyman-Fisher Funeral Home is on the left. Take exit 172. Make right off exit. Go straight for approximately 3 miles. You will come to a "T" intersection (you cannot go any further). Make a left onto Middletown Road. Continue straight. You will come to a traffic light. Continue straight through traffic light for approximately 1/2 mile. Make a left onto Franklin Avenue. Wyman-Fisher Funeral Home is two blocks down on the left.